This year we introduced a new business intelligence (BI) capability into the company’s flagship product. The project required the documentation team to create write-ups for the BI reports and dashboards based on the contextual impact of the business needs and design elements. During the project, we discussed about the possible impact of information structure on the presentation of information; the impact of design on the structure of information; and the differences between information architecture and information design. I remember that those who worked on improving the visual aspect of the dashboards were as much dependent on the business requirements as were those who worked on formulating the need-based rules and requirements. Besides, the design elements could only be implemented after the required information flow and business logic was established. Information design follows information architecture. As I understand, information architecture is about the textual and contextual appeal, while information design is about the visual appeal. While the language of information delivery is a critical aspect for one, the sensory drivers, such as colors and shapes are critical for the other. But, this post is about information projection; about the elements that overlap information architecture and information design; and about the parameters that affect those overlapping elements. Information Projection covers the elements from both information architecture and information design. As you can see from the Venn diagram, it (represented by the red dot) lies on the overlap of information architecture and information design. As I understand, it is a blend of language with design; knowledge with perception; structure with sensory drivers; and cognition and action with appeal, emotions, and experience. Information Projection lies on the overlap of Information Architecture and Information Design. Information projection appears to have layers that resemble the layers in an onion. Each layer represents an element that maps to both information architecture and information design. Just as with onions, only the outer layer exposes, unless you either remove it or cut through. I have also found that each layer of an element has an underlying affecting parameter. This means that if I can understand the effect of those parameters on the layers of overlapping elements, I can improve the way I interact with my readers. Layers of Information Projection resemble the layers of an onion. This is the first layer. This is where the communication happens. Language is the affecting parameter of this layer. That is because, if my reader and I do not speak a common language, we will not be able to communicate – not at least using the verbal or written mode of communication, and definitely not through a product-based document. There is an exception though. I remember that on one of our international trips, my wife and I referred to the Infographics in order to reach the immigration desk. Similar to most of the other visitors, even we did not know the language of that country. However, the Infographics helped us find our way through to the immigration desk, and later through the city. Interaction was still possible, but based on some conditions, such as the use of graphics, gestures, and paralanguage. In the context of technical communication though, physical presence is not possible. Therefore, the use of gestures and paralanguage is impossible. In such cases, Infographics can help. Keep in mind though that not all things can be communicated using Infographics. Ours were relatively easy tasks of reaching the immigration desk and traveling through the city. We would have faced lingual barriers had we attempted communicating with the people in the city, because most of them either did not know or could not speak English. This is the next layer. My readers read my documents to collect information. They also “Google” their queries to search for information from other sources. Mostly, the only purpose of searches is to troubleshoot issues. In such cases, googling for information can end up your searches with more information than you can handle. Information, therefore, is the parameter in this layer. However, it is not information, but its use that matters. I have a list of questions that helps extract data from information. One of those questions is, “How much of information do I really need?” Of course, it is not easy to answer that question, but keeping things simple always helps. Some of the other questions that help are, “What is it that I really want from this thing?”, “Where does this information head me to?”, and “Now what?” These questions help extract the raw data for evaluation, which is the next layer. This layer helps formulate and evaluate the information assimilated. Knowledge (both produced and acquired) is the parameter in this layer. Produced knowledge derives from the first-hand experiences. Today, everything from the reviews on the internet, shared videos, social networking, personal interaction and feedback, and product demonstrations can help you acquire (and exchange) experiences. Facts and their derived conclusions from such passive experiences form acquired knowledge. Here, some of us may feel that evaluation depends greatly on perception, which is a parameter for the next layer – Cognition. We must realize that perception is subject to emotions and experiences. We may use experience in order to evaluate. However, it would be inappropriate to let our perceptions affect our evaluation processes. 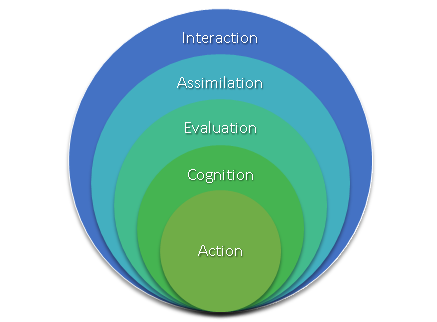 The next layer is the Cognition layer. For tech writers, this is the last layer of interaction. The “need” triggers the Action layer (see the above picture). Therefore, even though “action” is the intention of our interaction, it does not become a part of our responsibility. For the Cognition layer, perception, which is a combination of experience, knowledge, and truth, is the key parameter. During one of our regular interactions, one of my fellow SMEs said that arguments, bickering, and differences occur wherever there are three versions of truth: two respective truths of those who argue and one absolute truth. However, unlike those respective truths, the absolute truth remains unchanged. In such cases, our experience and knowledge can help us make correct decisions. Our documents (must) intend actions. We write to serve to the business needs of our customers. We want them to use the knowledge to “do,” and eventually “achieve.” The business need is one such absolute truth for us. The new project brought great learning for me. I learned a lot especially about the small things that affect information architecture and information design. However – irrespective of what I learn and explore about technical communication – the absolute truth remains unchanged. Peeling this onion – of Information Projection, from the first interaction to resolving our readers’ issues – to achieve that absolute truth may bring me to tears (kidding), but it is indeed worth it. Good post, and interesting read. I love this topic. Thanks for sharing.